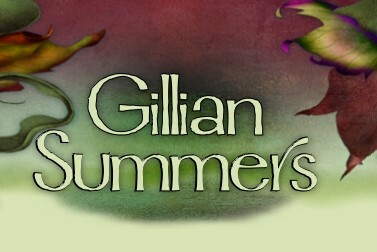 A forest dweller, Gillian was raised by gypsies at a Renaissance Faire. She likes knitting, hot soup, costumes and adores oatmeal, especially in the form of cookies. She loathes concrete, but tolerates it if it means attending a science fiction convention. She's an obsessive collector of beads, recipes, knitting needles and tarot cards, and admits to reading InStyle Magazine. You can find her in her north Georgia cabin, where she lives with her large, friendly dogs, obnoxious cats, and an occasional fairy. Really, Gillian is the creation of two Georgia writers, Berta Platas and Michelle Roper, but her bio reads like our lives. Minus the gypsies. Gillian loves to hear from her fans, so write to us! All content copyright © GillianSummers.com 2007-2014. All rights reserved.